Turn left out of the East Gate of Mita Campus and you’ll see the Japan Radio Tower, more commonly known as Tokyo Tower, in all of its glory. Strangely enough, Tokyo Tower was completed in 1958, exactly 100 years after the founding of Keio Gijuku, witnessing Japan’s postwar reconstruction and subsequent economic growth following World War II. 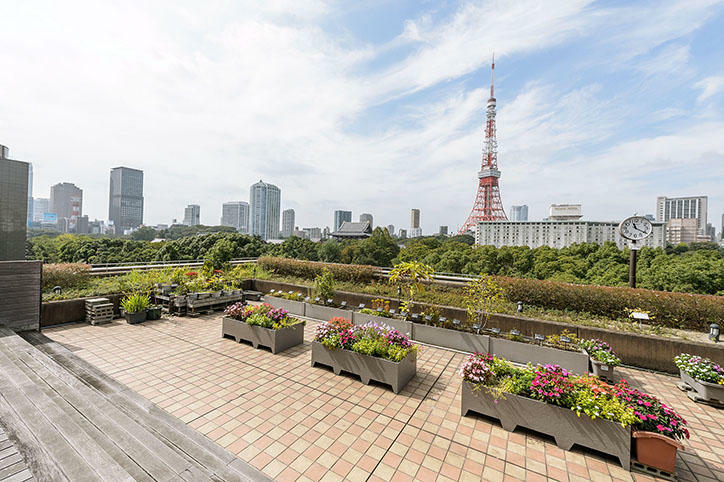 Though Tokyo Tower’s days as a radio tower may be over—having passed that role onto Tokyo Skytree—it still commands a dominating presence as one of the most memorable landmarks of the Tokyo skyline. "...[Mita] is on a hill overlooking the great bay of Tokyo with good air and a fine view," Yukichi Fukuzawa reminisces in this quote from his autobiography. It is well known that he enjoyed the vistas from this high ground. It was 1871 when Keio University moved from its home in Shiba Shinsenza to its present location at Mita in the former residence of the Shimabara clan. For more than fifty years, the Hill of Mita was the solitary home of Keio, from Yochisha Elementary School to its university faculties. Fukuzawa’s commentary lives on in school songs like Oka no Ue (Up on the Hill), with lyrics like "The sky is blue on the hill" and "Open the windows for a glimpse of the sea." In fact, you could still see the ocean around Shinagawa from Mita Campus until the mid-1970s. 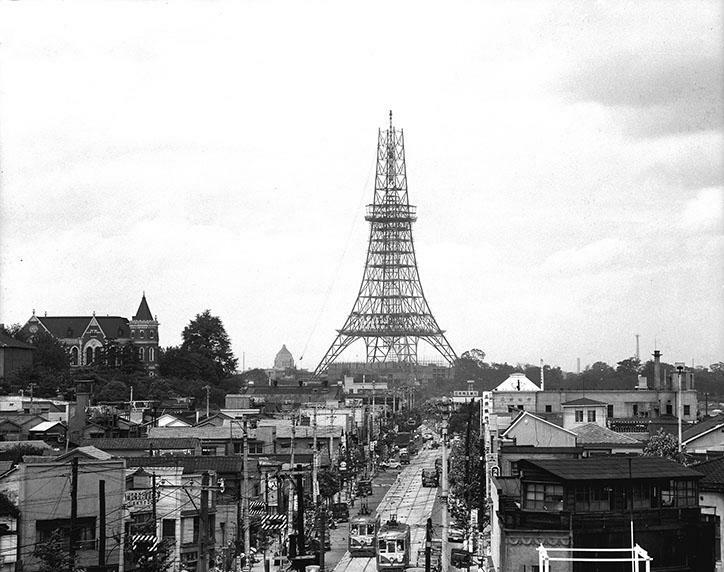 In 1958, Tokyo Tower was also clearly visible from campus, rising spectacularly over downtown Tokyo as the tallest building in Japan. In the February 1976 issue of Mita-hyoron, a second-year student from the Faculty of Letters wrote, "You can see Tokyo Tower as you leave Tamachi Station and walk down the stairs into Mita." Students must have gazed up at Tokyo Tower on their way to school from Tamachi Station at a time when there were no surrounding high-rises. Today, Tokyo Tower can be found outside the East Gate of Mita Campus, due north on Mita Dori toward Akabanebashi. But when Tokyo Tower first opened, this was the main entrance to Keio, opening onto the grand avenue with the tower standing proudly in the background. 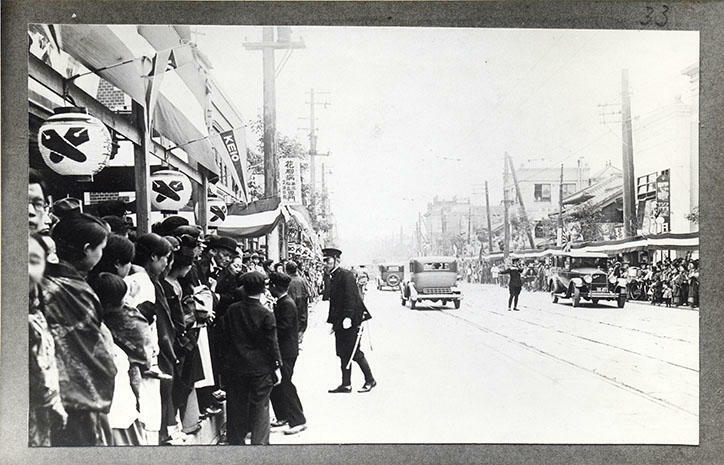 A streetcar stop was placed in front of Keio University on Mita Dori in 1904 and was used by many students on their commute to school. A college town developed along the avenue, complete with bookstores, coffee shops, restaurants, and stationery and clothing stores, which sprung up one after the other. Fortunately, much of the Mita area survived World War II, having largely been spared from the air raids over Tokyo. The Front Gate of Keio University moved to its current location in 1959, and streetcar service was discontinued ten years later, causing students to relocate to other areas around Tamachi Station. During and after Japan’s period of economic growth, the privately owned mansions of Mita slowly changed hands, becoming foreign embassies and condominiums. Mita Dori, too, went white collar with its office buildings, and with subsequent road expansion, there is now hardly a trace of the college town that once was. 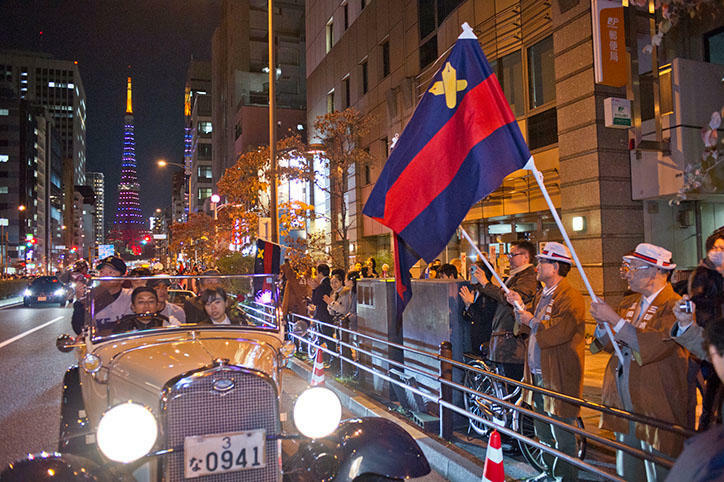 Even so, the Keio University Baseball Team still celebrates its triumphs at the Tokyo Big6 Baseball League with a parade down Mita Dori, where local proprietors along the street come out to congratulate the athletes. This is one moment when you can still feel the bonds that exist between Keio students and the neighborhood of Mita. Keio University has shared numerous events associated with Tokyo Tower in recent years. As part of the Keio University Art Center’s (KUAC) curatorial workshop Art Management Lecture 2009, an exhibition on Tokyo Tower was held in the Mita Campus East Research Building Exhibition Space in cooperation with Minato City. Mita Festival and Tokyo Tower both celebrated their 52nd anniversaries in 2010, which culminated in a collaboration titled, "TOKYO TOWER × MITASAI 52nd," where Tokyo Tower served as a main venue. In addition to performances by student groups, there were also exhibits on the history of Tokyo Tower and Mita Festival. While only a day in length, the event was a great success. Just across the street from the tower is Shiba-Kyoritsu Campus, home of the Faculty of Pharmacy, which celebrates its 10th anniversary this year. From its lofty height of 333 meters, Tokyo Tower continues to keep a watchful eye over the city and the progress of Keio University. *This article appeared in the 2018 summer edition (No. 299) of Juku.